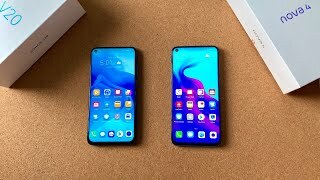 The Honor V20 (or the Huawei Honor View 20) is officially here and looks like most of the phones will get rid of that top notch in 2019. This mid-range phone got rid of the top-notch or waterdrop notch and placed the camera at one corner of the screen, an in-screen punch-hole selfie camera. To learn more about this flagship phone from Huawei and the Huawei Honor V20 Dubai price, continue reading. We have seen some leaked pictures of the upcoming Samsung Galaxy S10 where the company tried to fit in the front camera inside the display instead of adding a notch. However, Huawei managed to release a similar looking phone, the Huawei Honor V20, way ahead of Samsung’s official announcement. While all the companies are either following Samsung’s no notch trend or Apple’s top-notch trend, Huawei decided to go for a different approach which gives the phone a unique look. Most of the phones in 2019 are expected to follow this trend. The bottom chin is still there so it’s not completely bezel-less but the screen-to-body ratio is quite impressive. The big 6.4-inch LCD screen shows 2310 x 1080 pixels resolution and 398ppi of pixel density. It’s not water resistant but the phone didn’t ditch it’s 3.5mm headphone jack either. Users can find this phone in four different colors after the Huawei Honor V20 release date UAE: Magic Night Black, Phantom Blue, Sea Blue and Red. Where the Huawei Honor V20 truly shines is it’s 48-megapixel camera on the back. Instead of doubling down on phones with two or three cameras, Huawei included on single 48-megapixel sensor and a 3D ToF sensor. We will be able to learn more about its camera after the Huawei Honor V20 release date UAE. As for the in-screen selfie camera, it’s a 25-megapixel one with f/2.0 aperture. Users will be able to capture 720p videos at 960fps. It’s definitely going to give the OnePlus 6T a run for its money but we will have to wait for it’s international release before we start comparing it to the likes of Samsung Galaxy Note 9 and Huawei Mate 20 Pro. It’s not just the camera of the Huawei Honor View 20 that’s noteworthy as the phone has some more trick up on its sleeve. This phone is packing the world’s first 7nm process mobile AI chipset: Kirin 980 octa-core processor paired with an optional 6 or 8GB of RAM depending on the version you choose. Like some of the latest Samsung phones and the Samsung Galaxy Tab S4, users can use this phone like a desktop by connecting to a monitor, keyboard and a mouse. Moreover, it’s packing a big 4000mAh Li-Po battery which also comes with 22.5W SuperCharge. Users will be able to get up to 55% of charge just by charging the phone for 30 minutes. Considering the Huawei Honor V20 Dubai price, it’s definitely a complete package with multiple attractive features. The Huawei Honor V20 is expected to be available for about AED 1600 . Huawei didn’t confirm it officially so it is possible that this price might change when released internationally. It’s already available in China and the Huawei Honor V20 release date UAE is expected sometimes after January 22, 2019.